Phil: I assume they are taking the data from android mobiles that have the location factor turned on. Hey: that signals where you are. I believe the default setting is for location data to be turned on. After the presentation came out on mobiles I turned my location setting off. Every day, multiple times a day I get messages: “Google (or android” ) wants your location data….or something like that. Its been about 2 months. its endlessly repetitive. I’ve grown to hate those messages. Personally I don’t want google to know where I am. Who are they? My family? My daddy or mommy? my wife, or kids, or my boss or my commanding officer. They don’t need to know. So what about the consumer side and the business side? If I would like to dine out, the data is certainly interesting. I suppose if I looked at a dozen restaurants in an area…it might give me the best times to “pop in” and get a table. Okay. That is a help. If I’m a business person, I like the data to be able to “spy” or get a sense of my competition. I hate that it is out about my restaurant. Strategically if all the restaurants in my region are slow at certain hours…maybe I’ll be the first to run a killer “happy hour” or promo of some kind to try and bring in peeps at the slow times. Now if I want people to actually click on my site, speaking as an SEO….I really don’t like this…as I don’t like so much that google is doing. Its google info. Its not my website. Google controls the knowledge panel (kp) not me. Don’t forget. Below the “popular times” at the bottom of the KP about MY BUSINESS….google has links to five competitors and a link to MANY MORE. The KP has NO LINK TO MY SITE. Google is showing a link to a “menupages site. Not a link to my site. All of this stuff takes away from the left side results of the web search. What is on the left side??? The business website!!!!!!!!!!!! Hey remember that???? Its where people used to go before Google started stealing data. And subsequently stealing eyeballs. 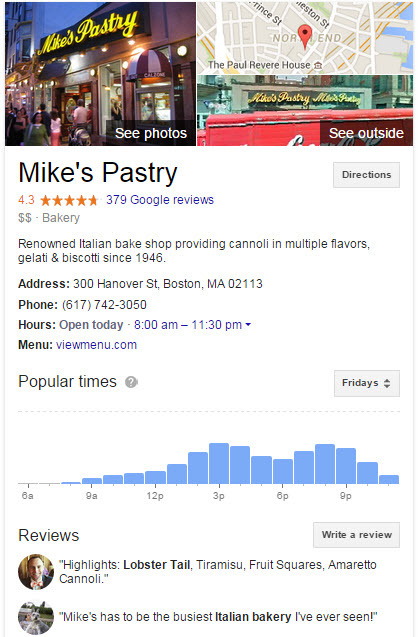 Mike’s Pastry’s FB page: 5400 votes (reviews)….plus that is a page with Mike reaching out to customers……..and so on. google owns the highway and is directing everyone to google pages. and to heck with everything else. Great points, Dave. There is more than a whiff of Big Brother here. One interesting thing about this feature is Google’s “Popular Hours” are falsifiable by business owners. 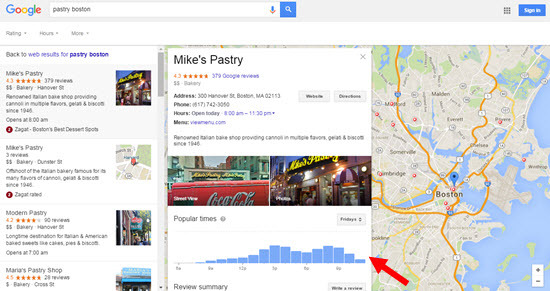 We’ll see how accurate – and potentially helpful – Google’s numbers are. Whoa did not know that they moved this over to Desktop! That makes doing competitive research so much easier! I actually created a model for one of my clients, where we wanted to analyze which competitors had more traffic at times that our business didn’t. If you want to take a look here is a link to the blog post (bit.ly/1JpUeBg) I made for it. It pretty much was a lot of photoshop work. I’m glad to see this on a small business level. 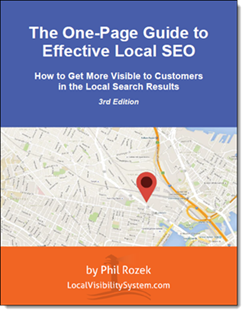 It gives small business owners some more information about the competitive landscape, without having to hire under cover market researchers or guess. We currently are using the information to investigate the times that the other restaurants are doing well and seeing what is the cause. The one clarifying question I have though. For iPhone users, does the information not register those users? I know that if they are using google on their phones then Google is probably registering but if they don’t use Google, then does this mean Google probably is not able to collect that info. If so, that can skew the info for different businesses that may have customers who are more apple oriented. I work in automotive SEO and starting to see Popular times for car dealership related phrases. For example “mercedes portland”. Thanks, Dan. Great find. I’m seeing the same thing now, too.